Amazon.com Inc. topped Wall Street’s earnings forecast for the third quarter but fell short of analysts’ revenue projections, even as sales surged nearly 30%. Meanwhile, the e-tail giant saw a quarter-to-quarter decline in sales at physical stores, which include Whole Foods Market. That marked the second time in the past three quarters (including a full contribution from Whole Foods) that physical stores had a sequential decrease. For the third quarter ended Sept. 30, Amazon totaled sales of $56.58 billion, up 29% from $43.74 billion a year earlier. Sales in North America rose 35% to $34.35 billion from $25.45 billion. Online sales climbed 10% year over year to $29.06 billion from $26.39 billion. At physical stores in the third quarter, Amazon recorded its lowest sales total so far this fiscal year, with revenue of nearly $4.25 billion, down 1.5% from just over $4.31 billion in the previous quarter. No direct year-over-year comparison was available for physical stores since the Whole Foods acquisition closed during the latter half of 2017 third quarter (on Aug. 28) and only included a partial sales contribution from the grocery chain. 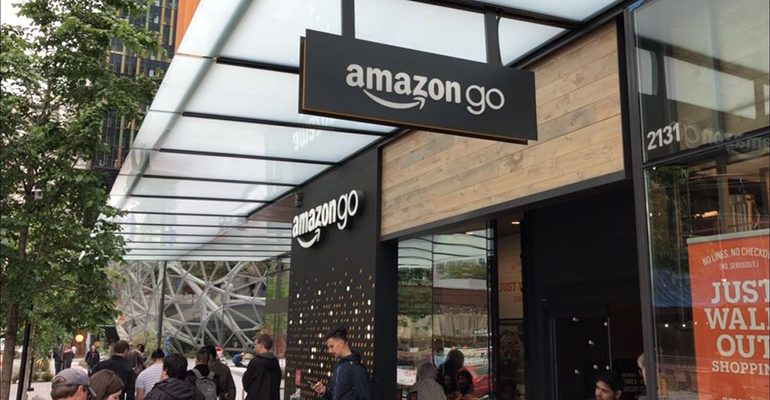 Currently, Amazon has 603 physical stores, including 492 Whole Foods locations (472 in the United States), six Amazon Go convenience stores, 18 Amazon Books stores, one Amazon 4-Star outlet and 86 Amazon Pop-Up sites. Amazon doesn’t break out sales data for Whole Foods in its quarterly reports. According to panelists at the SN Financial Analysts Roundtable, held in mid-September, that has made it tough to assess what kind of lift Whole Foods may have received from the acquisition by Amazon. “It's certainly difficult to still get a grasp on what or how Whole Foods is necessarily performing. They turned positive after multiple years of negative same-store sales, and they had slowed down growth up until recently, when [founder John] Mackey declared that they're going to accelerate unit growth again. But have they been outright successful?” Jefferies analyst Christopher Mandeville said at the event. What might be coming up for Whole Foods is more in-store automation, leveraging Amazon’s “Just Walk Out” technology used in the cashierless shopping experience at Amazon Go, Mandeville suggested. “I'd venture a guess it won't be too long before we start seeing elements of that in a Whole Foods test pilot, similar to what we see with the Go concept but on a larger scale,” he said. At the bottom line in the 2018 third quarter, Amazon reported net earnings of $2.88 billion, or $5.75 per diluted share, compared with $256 million, or 52 cents per diluted share, a year ago. Analysts, on average, had projected earnings per share of $3.14, with estimates ranging from a low of $2.25 to a high of $4.40, according to Thomson Reuters.